Here are a few quick facts about me. Favorite color: Don't have one--I love them all. Favorite children's book as a kid: The Monster at the End of this Book. Favorite children's book now: Rosie Revere, Engineer -- in honor of Poetry Month. A favorite thing to do: Go for a nature walk with our poodles. A place I'd love to visit: England, Norway, New Zealand ... do I have to pick just one? Not-so-guilty pleasure: Chocolate, of course! ​And below is more of my story. ​When I was a little girl, my dream job was to be a children’s book illustrator. But this seemed impractical, improbable and impossible. So I grew up and worked “real” jobs: dental assistant, pizza maker, cleaning lady, and even a stint as a face painter and caricaturist at the Toledo Zoo in Ohio. Art was a hobby. Friends and family kept urging me to use my talent in a professional as well as personal way. It was more than a little scary, but I gulped, took the leap and became a freelance artist. Since 2009, I've had the privilege of illustrating 49 children’s books. I've even written one of my own, Pug Is Happy , published by Pygmy Giraffe Publishing. (Psst ... there are other books in the works too!) It's been amazing to work with clients from all over the world, including far-flung places like the Netherlands and Australia, and some pretty cool organizations too (like the Arizona-Sonora Desert Museum). Forever a kid at heart, I live a quiet life in rural Michigan, which is just how I like it. 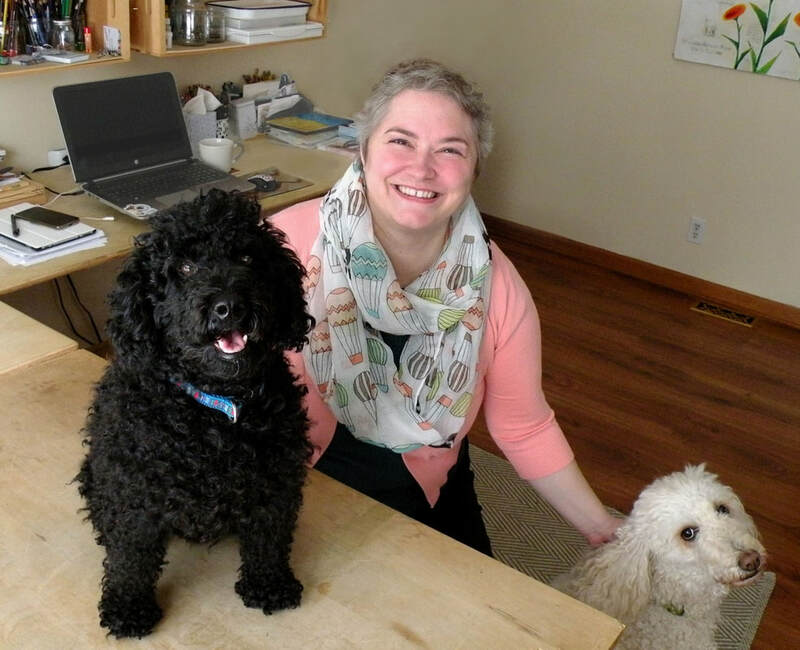 Almost every day, you can find me in my sometimes-sunny studio, happily surrounded by poodles and art supplies.